Fabulous Colors, Adorable Characters, Cute Patterns! Christine joining you today and declaring that Under the Sea has all of these and if you're like me will make you want to squeal with delight at all the fun it has to offer! 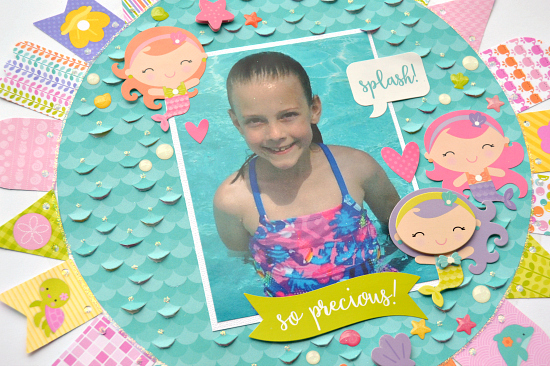 I decided to pull out a picture of my only daughter having fun in the sun and showcase it with this layout. My goal was to find a way to use the Die Cut Banner pieces in a fun and unique way. As I was moving them around and looking at them I realized - hey why not use them around a circle!?! They don't have to be a banner! I love how doing this helps them mimic a sun or a flower - both perfectly appropriate for the feel of the layout! I did a pattern using the four different banner shapes and trying to alternate colors, patterns, etc. I thought the mermaids in the collection were so fun that I used several of them! 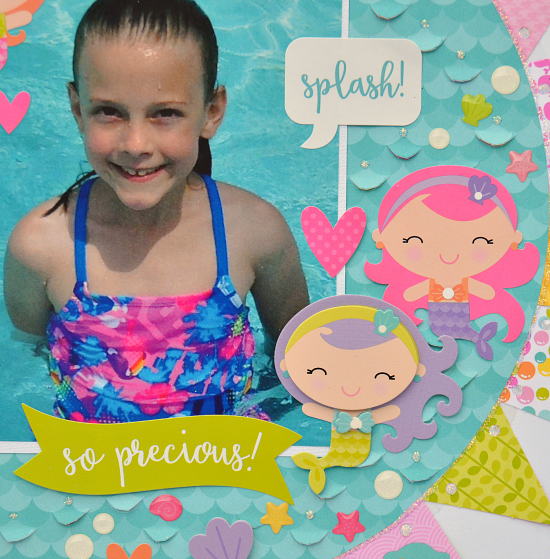 They even have one come in Doodlepop form - adding some dimension to the layout! Pieces from the This & That Sticker Set helped provide a title and subtitle for it. I used a mixture of the Lily White Glitter sprinkles and Under the Sea Shape Sprinkles to surround the mermaids. They add such a fun touch of whimsy and pops of color and dimension too! I specifically chose the background paper for my circle that I did for several reasons: it matched the water in the picture almost perfectly, it reminded me of waves and mermaid scales, and I knew I could go crazy with my craft knife and make it pop! After I cut out the circle and placed my picture on it - I used my craft knife to randomly cut up scallops and pull them up. I didn't count or do any pattern I just looked at it as I went and filled in where I thought it could use another. I then topped those off with a dab of glitter glue. I am always drawn to scallops and using my craft knife with them and am always pleased with the results too! Stay tuned for even more fabulous Under the Sea projects coming your way over the upcoming days! Love what you did with the banners!!! Wow! Impressive LO! 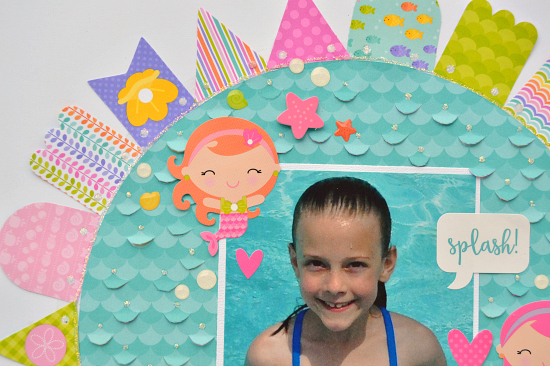 I love how your photo coordinates perfectly with the gorgeous papers, banners and embellishments. Clever use of the banners! This is one of my favorite collections that you guys have ever done! 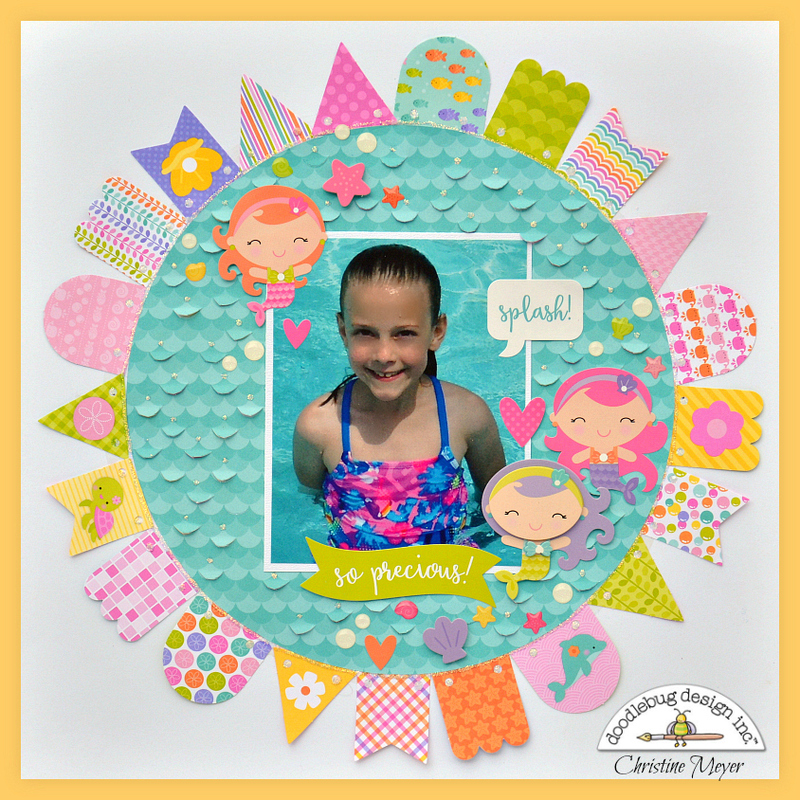 Such a beautiful layout Christine! The banners, the waves and the photo are all perfect!!! Super fun design Christine!! Love those banners!